As many parents will already know, being mother to a large and unruly brood of kids can often be an exercise in pure patience. 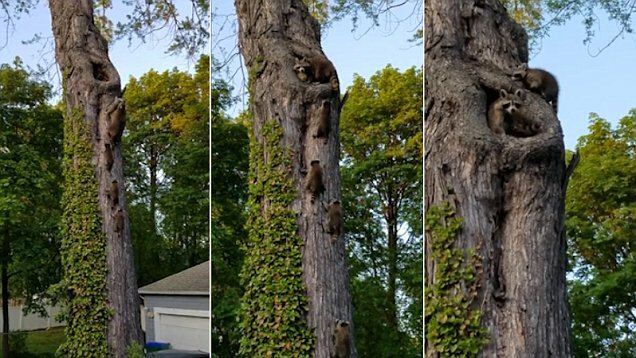 So spare a thought for this raccoon mother-of-four who was caught on film trying to drag her brood back into their tree house. Filmed in Medford, Massachusetts, the mom's frustration is palpable as she drags her children up the tree, already holding one between her jaws. She quickly takes the first youngster in the safety of the tree, but if she was expecting the others to be hot on her heels she will have been disappointed. Instead the rest of the clan seem to lose their way, climbing up and over their hiding hole as one hangs off a precarious-looking strip of bark. Poking her head out of her home, mother raccoon wastes no time grabbing the wayward cub and dragging him alongside another of his siblings, despite his best efforts to cling to the tree. Mom returns for the last child but has her hands full trying to keep the rest in the hole as she tries to drag the final sibling to safety when the footage ends. Responses to "Family of Raccoons Are Marshaled Into Their Tree House By Mom"